When it comes to the costs of improving your home, most would assume that interior design is not an area worth considering right now. Interior designers are expensive to hire and they choose uppity items that are way out of your economic means, right? Not necessarily. Most interior designers understand that people are pocket-pinching right now, and they know the best techniques and places to shop to help you find the most affordable items. Hiring an interior designer might even save you money in the long run. If however you’re looking to update your home without professional help, here are some tips that were gathered right from the mouths of interior designers. The goal of decorating right now, according to one designer quoted in the 2010 issue of Home & Design Magazine, is to “go into what we call the soul of the home.” This means updating the items in the house that you find most important or sentimental, while also saving money and being more environmentally conscious. Repurposing and reupholstering items that you already have is the most popular method of design right now. This allows you to keep pieces that hold meaning and memories, to reuse a worn piece rather than throw it out, and to update the look of your piece at a low cost. Another popular designing tip right now is to decorate with neutral colors. Some interior designers consider this the number one tip for home designing, because neutral colors never go out of style. Ten years from now, your neutral décor will still look fresh and chic. So when you go to paint, use no or low VOC pain in tans, chocolates, grays or eggplant shades, including dark purples, plums and mauves. If you are updating your countertops or floors, you should use neutral colors and renewable materials, such as bamboo or cork. When you reupholster your furniture, use neutral colors as well. When do you embrace current trends? Since trends are always changing, a popular rule of thumb that interior designers recommend is that you paint and update permanent items in neutral colors, and then you accessorize with trendy colors. For example, turquoise is the current color for spring and summer of 2010, so home designers should accessorize with turquoise artwork, curtains, dishware, throw pillows and any item that you can easily switch out and replace with a new trendy color down the road. Also, metal art and animal prints are both popular accents right now, which also both coincide with neutral décor. There is always a way to update your interior design and keep up with current trends while still saving money in the process! Whether you’ve been enjoying warm weather for months now in Florida or are still waiting for the beginnings of hot sunshine in Wisconsin, one thing’s for sure: we all love air-conditioning during summer, don’t we? Each year, one-sixth of the United State’s electricity consumption is attributed to air conditioners. 70% of the nation’s acid rain comes from the electricity generation by fossil fuels (11.6% due to air-conditioning). 29% of the nation’s greenhouse gases come from the electricity generation by fossil fuels (4.8% due to air-conditioning). Installing ceiling fans will not only be more energy efficient, but by doing so, you will also save money on your utility bills! And you can still control your new cooling system with the push of a button or the pull of a chain. Q: Why should I use a ceiling fan instead of air-conditioning? Ceiling fans are quiet. You don’t hear anything when you turn it on or off, or even when it is running constantly. Ceiling fans save energy. They only use 50-75 watts of power. That is the same as a light bulb and less than one-tenth of the power it takes to run a medium-sized air conditioner. Ceiling fans save money. Running a fan costs almost $25 less per month than it does to run an air conditioner. Q: How are ceiling fans beneficial in the summer? A: Although a ceiling fan will not lower the temperature in your home, it will make a room feel cooler. When you open doors and windows, warm air is circulated from inside the room to the outside of your home. This action can make you feel up to eight degrees cooler! Inside tip: During the summer, run your ceiling fan in a counter-clockwise direction for maximum efficiency to lower electricity costs and to conserve energy. Q: What kind of ceiling fan should I buy? A: Energy Star ceiling fans are a good choice. According to the company website, Energy Star ceiling fans can save you up to $15 per year on your electrical bill, and they are fifty percent more efficient than conventional fans! Q: What size ceiling fan should I buy? A: It is a grave mistake to install a huge fan in a big room or a tiny fan in a large room. Not only will it look awkward, but you might not get enough airflow. 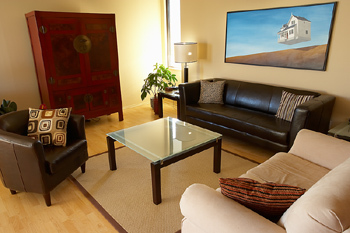 Large rooms (15-by-15+): Use a fan with a blade span of 50 – 56 inches. Medium rooms (12-by-12): Use a fan with a blade span of 42 – 44 inches. Small rooms (8-by-8): Use a fan with a blade span of 32 inches. Q: Where should I install a ceiling fan? A: You should install ceiling fans in the rooms that get the most use. Once you choose the rooms, you should hang your ceiling fan in the center of the room, 10 to 12 inches below the ceiling. If the blades are too close to the ceiling, the air will not circulate. 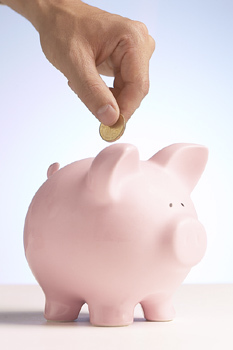 Check out some more energy-saving and green-living tips here on the Buy Owner Blog! In our society, running water is a given. Probably the only time we give it any thought is when something goes wrong or when we get the monthly water bill. It’s a necessity, so we have to pay for it. But do we have to pay so much? In actuality, there are a number of easy things you can do to reduce your water bill. 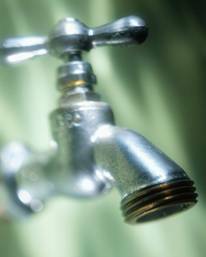 Leaks – Did you know a dripping faucet can waste up to 20 gallons of water per day? One or more leaks-in the sink, the shower, or the tub-can really add up over time. By regularly inspecting your faucets, you’ll decrease your chances of leakage. If you do find a leak, try replacing the washers. Older, often-used washers begin to let water leak; replacing them renews their efficiency. Or for a leaky toilet, replace the flange in the tank (the little piece that lifts when you flush) and make sure it fits snugly. Insulation – Did you know insulating your pipes will make water heat faster and mean you’ll waste less water, waiting for it to heat up. Make this your mantra: waste not; want not. Try not to ever put water down the drain that could be used for something else. For example, cooled vegetable water can feed house plants. Overall, see if you can find ways to use water less frequently: only do full loads of clothes or dishes; turn off the sink when you’re brushing your teeth; don’t boil a whole pot of water for one cup of tea. Avoid disposing of tissues in the toilet, where you’ll need to flush; just use a trash can instead. Do whatever you can to minimize the amount of water you expend. Replacing fixtures doesn’t have to be expensive. 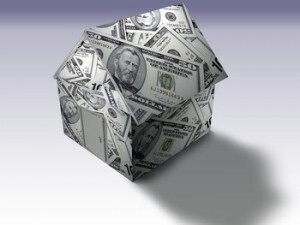 In fact, there are a few cost-effective improvements that justify their cost incredibly quickly! Showerhead: Looking for a way to lessen the amount of water used in your daily shower? Consider a low-flow showerhead! It reduces the amount of water used; some models even offer pause buttons to allow you to stop the flow while shampooing. A water-saving toilet uses half the water that a normal one does in flushing. Older toilets use five gallons per flush; newer ones often reduce this to 1.6 gallons per flush. When you multiply that by uses per day, per week, per month, this can add up to big savings!